Oh Nina, my beloved. The crowd is on its feet. They are screaming our names. You gaze up at me and I see your startled look of love. It is in the lap of the Gods now. We have given everything. You were with me all the way, trusting me. Perfectly synchronized, we breezed through all the required elements. You dazzled as I held you overhead. Every time I launched you into the air, you spun into orbit like a silver bobbin, blades flashing. You even landed that axel with aplomb. Your edges were always perfect. You could have competed as a single, but you chose me, instead. I was not the obvious choice, a few years older, something of a veteran compared to you — but we clicked. Platonov, your first instructor recognised it and so did Ranevskaya, eventually. That old turn coat, switching her jacket to coach the American pair — not like the old days of solid loyalty. Your breathing has become a little ragged, I hold you closer. I fell in love while watching you warm up in that worn practice dress with the torn cuff. Still a junior then, but you knew how to thrill a patchy crowd in a chilly ice arena. I was merely the temporary partner, someone with experience, not likely to leave you cut or bruised at a tender age — but we blossomed and they could not part us. After our first short programme at Lausanne, I wanted to drag you off the ice to the ‘kiss and cry’ and make love to you, while still in our boots, toe pick to toe pick. We were Romeo and Juliet and Ruslan and Ludmilla — in some pretty terrible costumes. I offered you up to the gods like no other, time after time. Maybe the night before the gala, and only then, would we permit ourselves to fall into each other’s arms. Ice turning to fire, so cool it burns. Our transitions were flawless. They became the most beautiful thing about our partnership. After I came back from the knee surgery, I could tell you were unhappy, a little distant. Our side by side jumps and spins, split seconds out of sequence — only seen in slow motion. Yet that softly spoken English commentator from the land of ice follies, where the sun has already set over the derelict rinks — he noticed. He could tell the finesse was crumbling away. Afterwards, you circled the ice alone, as the little rats scurried around to pick up the scattered bouquets. The gifts were always for you. 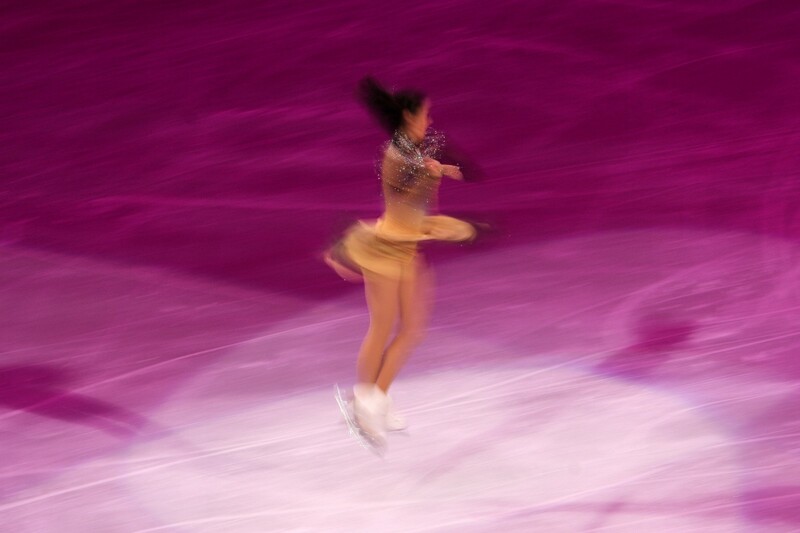 Then disaster struck — fifth place after the free programme in the Europeans. I saw you glancing at Balanchuk during the team warm up. Yes, those flowing blond locks would be such a startling contrast beside your sleek, dark head. I feared you might fall in love with the cossack upstart. I knew about the secret try-outs. “Your beloved Dima has become complacent, just a safe pair of hands,” they all said. Alas, I was steadily losing my precision, no longer clean. I was also drinking too much as I knew I was about to lose you. As you lie in my arms, near death, I kiss your pale lips. The big screen capturing our final moments together goes black. There is a trail of blood on the ice, marking a perfect circle. The death spiral is well-named, my love. My hands betrayed you, this time. The divine arc of your body — your head almost touching the ice, separated by a hair’s breadth, always something to behold. Put my failure down to love. No medals for us, but perhaps handcuffs for me. I will give you up. A rink-side medic is already examining your head wound. Another reaches out to touch my arm, but I glide away from him, in the classic attitude of a partner who has made a bad mistake, hands on hips, head bowed — willing the white space to swallow him up. A pair of stewards with no skates, rush on like circus clowns bearing a stretcher. The crowd has fallen silent. The streak of precious life blood where you once lay has now turned pink, frozen into the ice. I could have slashed your face in an ugly camel spin or hired someone to break your legs, but that is not my style. This way is more complete. Tomorrow I will follow you. We will be skating in paradise. Skating as one. No one will judge us ever again.